Watercolour with pen and ink of a portrait of Mr. Mackertich J. Mines the former Governor of Melun from 'A Series of Views in Burmah taken during Major Phayre’s Mission to the Court of Ava in 1855' by Colesworthy Grant. 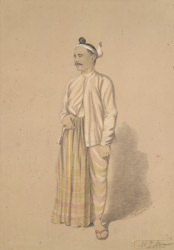 This album consists of 106 landscapes and portraits of Burmese and Europeans and documents the British embassy to the Burmese King, Mindon Min (r.1853-1878). Inscribed with the signature of the sitter.